Lets face it. You’re not too thrilled about having to clean your bathroom. We get it. However, cleaning your bathroom doesn’t have to be a chore. Think of it as a fun battle between you and those lurking germs. Remove dirty clothes, used cups, trash, and anything that may get in your way while cleaning. 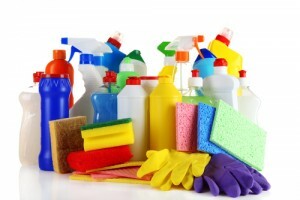 Clean your trashcan, tissue holder, toothbrush holder, soap holder, and other items. Wash your hand towels in the washing machine using the sanitizing setting or bleach them. Hand towels should be replaced with clean ones every 3-4 days. Don’t forget to clean the towel bar. Dust the room starting from the top down. Wipe off the fronts and tops of cabinets and drawers. Dirty showerheads can harbor mycobacterium avium, which is a pathogen linked to pulmonary disease. Turning on a dirty shower can fill your lungs with millions of germs. Shower curtains can be cleaned with a solution of about 2/3 water and 1/3 bleach. For shower doors, make a paste adding a few drops of distilled white vinegar to a cup of baking soda and apply it directly to the door. Let it stick for an hour, and then scrub it off. Clean grout by using a brush dipped in bleach. Scrub discolored areas, rinse, and ventilate the room. It is recommended to seal grout every 6 months. Doing so helps prevent moisture and grime. Spray tile, countertops, walls, and the ceiling with all purpose cleaner and turn on the shower until steam builds. Turn off the water, leave the room, and shut the door. Let the steam and cleaner mix for about 20 minutes, and then wipe down all surfaces. Pour a cup of baking soda or toilet cleaner into the toilet bowl. Let it sit for a few minutes, brush the toilet bowl, then give it a flush. Don’t forget to clean the outside of the toilet starting with the flush handle. Clean your sink by pouring white vinegar or baking soda down the drain. Flush it down with hot water. When cleaning the faucet use disposable disinfecting wipes, they’re great for killing bacteria. Congratulations! You’ve fought off those lurking germs. To make your next cleaning venture even easier make sure that you run your bathroom ventilation fan after you get out of the shower. Keeping your bathroom ventilated will discourage the growth of mildew. For more bathroom tips and tricks keep an eye on our blogs and resource library articles.